Peterson, a psychology professor from Toronto who has courted controversy for his views on transgender rights, gender and race, announced on Monday via his YouTube channel that he was joining Cambridge for two months. The University of Cambridge said Peterson requested to be a visiting fellow and was initially granted the opportunity, but after further review it decided to take back the offer. “[Cambridge] is an inclusive environment and we expect all our staff and visitors to uphold our principles. There is no place here for anyone who cannot,” a spokesperson for the university said. I’m glad to hear it has been rescinded but why was an initial offer ever made in the first place?? The truth is Cambridge just doesn’t have enough sage authoritative white men who believe they know better than everyone else and can tell the world how to run itself. We need to ship them in from outside. Enraged and disappointed with @Cambridge_Unithat Jordan Peterson has been given a visiting fellowship. Such hatemongering shouldn’t be given a place at our University. Well my hate has been well and truly mongered. So I’ll shut up before I say something I regret. Tags: Cambridge University, Jordan Peterson. Bookmark the permalink. Great title, great reporting and unprecedented restraint at the end. In a word, Cantabulous. IngSoc continues its steady rise to power. I think the Faculty of Divinity made a serious error of judgement in rescinding their offer to me (and I’m speaking about those unnamed persons who made that specific decision). I think they handled publicizing the rescindment in a manner that could hardly have been more narcissistic, self-congratulatory and devious. I believe that the parties in question don’t give a damn about the perilous decline of Christianity, and I presume in any case that they regard that faith, in their propaganda-addled souls, as the ultimate manifestation of the oppressive Western patriarchy, despite their hypothetical allegiance to their own discipline. I think that it is no bloody wonder that the faith is declining (and with it, the values of the West, as it fragments) with cowards and mountebanks of the sort who manifested themselves today at the helm. I wish them the continued decline in relevance over the next few decades that they deeply and profoundly and diligently work toward and deserve. P.S. I also find it interesting and deeply revealing that I know the names of the people who invited me, both informally and formally, but the names of the people who have disinvited me remain shrouded in exactly the kind of secrecy that might be expected from hidden, conspiratorial, authoritarian and cowardly bureaucrats. He was invited by the Faculty of Divinity, not by the “student body [politic]”. It’s disgraceful that the Faculty have apparently let themselves be leaned on by these activist snowflakes who seem to think that they represent the University and are therefore entitled to censor visits form academics they disapprove of. What of the teaching staff, within the Divinity Faculty and across the University more generally? Do they agree that Peterson’s visit should have been cancelled because he’s not politically correct enough? If not, by failing to speak up, they are moral cowards. I feel quite sorry for him. He was obviously looking forward to the visit. 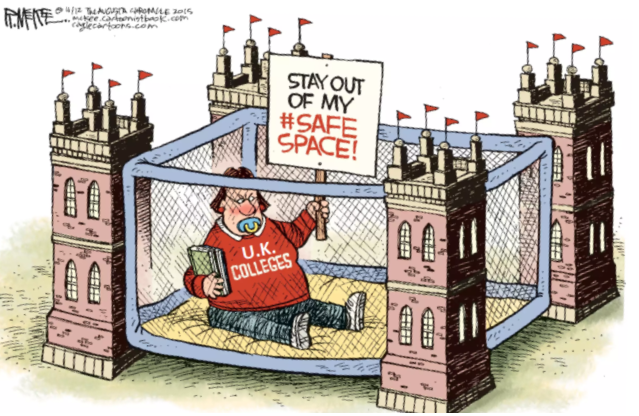 Cambridge University will only slide further down the academic excellence scale if it continues to allow these activist half wit semi-literate snowflake millennials speak on its behalf and decide who is and who is not acceptable as a visiting scholar. A School of Divinity not really following the example set by St.Paul. There are lots of other colleges, schools or whatever at the University of Cambridge which could extend an invitation to Professor Peterson. I wonder if one will? It’s a funny place, a traditional university like Cambridge. Wittgenstein went there to study engineering, but ended up at Bertrand Russell’s lectures on logic. Then he went back to Austria to fight against us in the Great War, and in the trenches wrote Tractatus Logico-Philosophicus, which was an attempted demolition of a large chunk of Russell’s life’s work. On the recommendation of Russell, (who had spent part of the war in prison for pacifism) Cambridge awarded him a lifetime lectureship. I wonder what the snowflakes or the bureaucrats would have made of them? “According to the Equality and Human Rights Commission’s ‘Freedom of Expression’ guide for higher education providers and students’ unions in England and Wales, no speaker has a right to be invited to speak to students on a provider’s premises, but once someone has been invited they should not then be disinvited. It even suggests this may be a breach of Section 43 of the Education (No 2) Act 1986, which places a legal duty on universities to take ‘reasonably practicable’ steps to protect freedom of speech. DaveJR: “IngSoc continues its steady rise to power.” And in the meta-battle of the 1940s dystopian fantasies (both of which I happen to read at er, Cambridge) That Hideous Strength also has its backers. > There are lots of other colleges, schools or whatever at the University of Cambridge which could extend an invitation to Professor Peterson. I wonder if one will? This is quite a plausible outcome I think. Cambridge is not yet entirely over-run by Guardianesque groupthink, and I’m sure there are some free-thinking academics there who are thinking what you’re thinking. Once the dystopian classics were read in the Academies as a warning, today as a users’ manual. Beth, I take my hat off to them. Pre-paid debit cards for ISIS terrorist head-choppers. Not even Orwell could have thought of that one. Jaime, as you well know, those behind the Green Door do guru very well. … ‘Don’t they, Mister George Soros? Isn’t it about time for that Brad Keyes to join the fray. A little subtle satire added to the wit above would not go astray, be amiss, add a je ne sais quoi of Nuremberg humour to this cool essay? How do you know he hasn’t already? A person of such flagitiousness camouflage needs no encouragement. The confident young protester says that petrol stations are painted green to make it look like their owners care about climate change* but they don’t and they really should because science says we have only eleven years to stop the planet warming so much that it will no longer be able to sustain life. He is going to keep coming back with his placard until the government obeys him and takes some serious action on climate change. Jason’s mother later apologised for the language, explaining that her son hadn’t had his tea and had been very tired after being beeped at and insulted by motorists for nearly an hour. This isn’t Jason’s first protest. Last year he devised a campaign that helped get Toby Young sacked by a quango – so perhaps this one will work too. *Of the major non-supermarket petrol station chains in Britain, BP is the only one to use a lot of green in its logo and other branding. Green has been its main colour for at least 70 years. WHO WE ARE We are you! You are so welcome to join us and participate, you don’t need our permission, if you agree to follow our principles and values. We need to take action in the world and we need to look after ourselves. This rebellion is fuelled by our love, which is growing because we are willing to face the grief of these times. Grieving is part of our work. There are groups for connection and support for Extinction Rebellion Sisterhood, Brotherhood, Elders, Young People, Muslims, Volunteers, Families with Young Children and groups springing up across the UK. Here’s a list of resources that may help. If there’s anything else you want to know check out our FAQs. 1. WE HAVE A SHARED VISION OF CHANGE Creating a world that is fit for generations to come. 2. WE SET OUR MISSION ON WHAT IS NECESSARY Mobilising 3.5% of the population to achieve system change – using ideas such as “Momentum-driven organising” to achieve this. 3. WE NEED A REGENERATIVE CULTURE Creating a culture which is healthy, resilient and adaptable. 4. WE OPENLY CHALLENGE OURSELVES AND THIS TOXIC SYSTEM Leaving our comfort zones to take action for change. 5. WE VALUE REFLECTING AND LEARNING Following a cycle of action, reflection, learning, and planning for more action. Learning from other movements and contexts as well as our own experiences. 6. WE WELCOME EVERYONE AND EVERY PART OF EVERYONE Working actively to create safer and more accessible spaces. 7. WE ACTIVELY MITIGATE FOR POWER Breaking down hierarchies of power for more equitable participation. 8. WE AVOID BLAMING AND SHAMING We live in a toxic system, but no one individual is to blame. 9. WE ARE A NON-VIOLENT NETWORK Using non-violent strategy and tactics as the most effective way to bring about change. 10. WE ARE BASED ON AUTONOMY AND DECENTRALISATION We collectively create the structures we need to challenge power. Anyone who follows these core principles and values can take action in the name of Extinction Rebellion. VISION A world where we build thriving connections within our society and environment, bringing hope and enabling us to decide the direction of our lives and futures. An inclusive world, where we work consciously to ensure fair processes of collective decision-making, where creativity is prioritised, and where our diversity of gifts are recognised, celebrated and flourish. MISSION To spark and sustain a spirit of creative rebellion, which will enable much needed changes in our political, economic and social landscape. We endeavour to mobilise and train organisers to skilfully open up space, so that communities can develop the tools they need to address Britain’s deeply rooted problems. We work to transform our society into one that is compassionate, inclusive, sustainable, equitable and connected. AIMS Support and encourage a citizens uprising in the UK (of about 2 million people) involving low level and higher risk acts of civil disobedience by some (with others willing to support those that take actions). When ready, create a participatory, democratic process that discusses and improves a draft manifesto for change and a new constitution. This will involve creating a genuine democracy, alongside an economy to maximise well being and minimise harm. LOOK DEEPER Our organising structure to date has been based on who was willing to step forwards. As we grow we are redesigning our processes to be more participatory, de-centralised and inclusive. To do this we constantly take feedback. Here’s more information About RisingUp – An Overview, which includes more about our strategy, how we work together and an in-depth look at our Principles & Values.